Author of “The Domain Game” discusses challenges, rewards of writing book. One of the added perks of attending last week’s GeoDomain Expo in Chicago was seeing David Kesmodel. 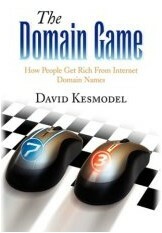 Kesmodel is a Wall Street Journal writer who took time off last year to write “The Domain Game”, a book about the domain industry and many of its participants. I talked to Kesmodel many times while he did research for the book and met him face-to-face in Austin last year. But now the book has been released and the positive press is flowing. I asked Kesmodel about the challenges he faced writing the book and what he learned from the adventure. I was surprised to hear about some of his experiences, including how some people didn’t want to talk to him because even their family members didn’t know what they did for a living. “The Domain Game” is available in paperback, hard cover, and Kindle at Amazon. Amazon is now offering discounts off the cover price. Domain Name Wire: Why did you decide to write The Domain Game? Kesmodel: I was intrigued by the risk takers and independent thinkers in the domain market and thought I’d enjoy telling their stories. I also believed there was a good opportunity to explain how this little-understood market evolved. No one had really written a detailed account of who domain investors are and how domain registrars, Icann and other parties are interconnected. I really felt it was a classic tale of gutsy, often irreverent entrepreneurs building an industry and making lots of money while most of the world focused on other things. My goal was, and still is, to show laypeople that there’s a fascinating marketplace for domains and that the business is a lot more complex and intriguing than what it might look like on the surface. Domain Name Wire: Domainers can be secretive. What sort of challenges did you encounter getting people to talk? Was there any pushback? Kesmodel: There was definitely pushback. A number of people simply said they weren’t interested in participating. And in some cases, they talked others into not participating. Some people didn’t want others in the industry to know they spent much time on domains and to get any sense of their investment strategies. Some domainers didn’t even want their families to know what they did for a living, or that they had a lot of money. I think some domainers were afraid that I would paint them in a negative light. That seemed particularly true for domainers who had dabbled in trademarked-protected terms and other controversial segments of the market. I had to be aggressive at times in order to get people to talk. One tactic was to explain to a domainer that I planned to write about him or her regardless of whether he/she was willing to be interviewed. I explained that it is almost always in the best interest of a subject of an article or book to participate so they can give their side of the story and make sure the piece is factual. For some domainers, there’s a long trail of public records, like, say, UDRP filings, so I could write about them even if they and their colleagues declined to participate. Domain Name Wire: What do you feel was the most fascinating information you uncovered? Kesmodel: The most fascinating part to me was writing about people who had been failures in certain ways–say, in school or in relationships or in another career they’d tried–but who showed remarkable foresight and business smarts when it came to domains. I was also fascinated by how important the drop game was to domainers, even to a great extent in the mid- to late-1990s. I am not sure I uncovered much there from a breaking news sense, truly, but for the layperson I think I found a way to explain the significance of the drop and link it to other trends taking place to show how this game works. There’s an ecosystem to this market that I still find really interesting. You have a very simple concept — words — at the core of domaining, but underlying that is a spider web of fast-evolving industries led by creative people, some of whom are good eggs and some of whom are, let’s face it, unethical. It’s still a Wild West in many ways. Domain Name Wire: After writing this book, did you decide to jump into the domain industry yourself? Kesmodel: Not really. I bought a few domains and am still mulling whether to invest in more. But unlike many domainers, I’m not much of a risk-taker. I’ve also been extremely busy with my work and family. In general, I get more enjoyment out of being an observer of business trends, and writing about them, than participating in them. Domain Name Wire: If you had to go back to the beginning and write your book again, what would you have done differently? Kesmodel: First of all, I would have given myself more time. I was pushed to write the book in six months by a publisher. I managed to basically make that deadline–I did get a two-week extension–but I think I could have done a better job with a full year. Along those lines, if I got to do this over again, I would spend more of my research and reporting time hunting down domainers that I could interview. Since finishing the book, I’ve met and heard from a lot of domainers who have stories that would have fit nicely into the book and made it stronger. I also would have spent more time in the book explaining how people flip domains. There are some good examples in there, but I would have liked to have extensively profiled someone who makes a lot of money from trading domains like a short-term stock trader. I also would like to have had more how-to elements at the end of the book. Finally, I would have made more efforts to meet domain investors in person to try to allay their fears about doing interviews. It can be difficult to put people at ease by phone or e-mail. I did meet many of the domainers in the book, and that really helped, but a few more trips to domain conferences and other face-to-face encounters would’ve helped get more people to open up. Amazon is now offering discounts off the cover price of “The Domain Game” in the following formats: paperback, hard cover, and Kindle.